My heart skipped a beat every time I noticed a new little red notification on the Mail app on my iPhone. We’d been keeping close tabs on the weather forecast for Tropical North Queensland for weeks now, and it wasn’t looking promising. Every new little red dot had the potential to ruin our plans for the weekend… yet again. 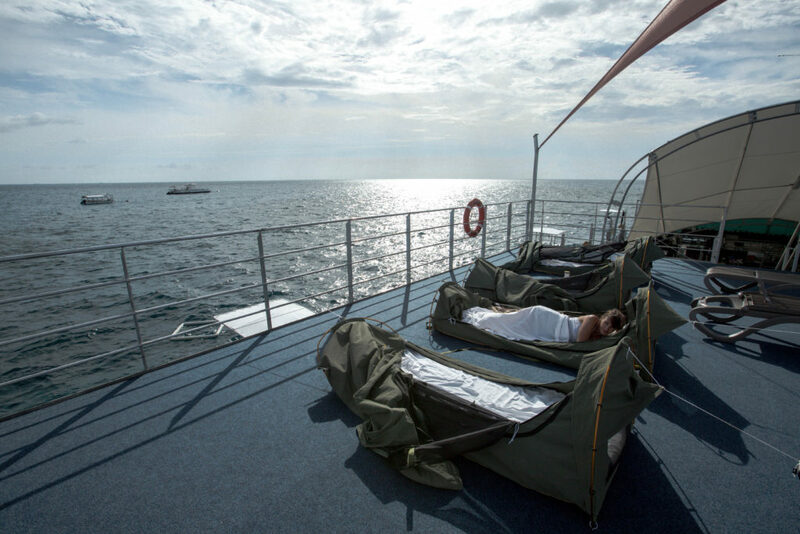 We’d attempted the Sunlover by Starlight trip twice already – both times we were left disappointed by terrible weather conditions that prevented us from heading out to the gorgeous Moore Reef pontoon on the outer Great Barrier Reef to sleep in swags under the stars. Would our third attempt be a success? Scott and I arrived in far north Queensland early on a Friday morning, welcomed by the hot, muggy temperature and drizzly skies. Blanketed in a layer of cloud cover, the ride into the city of Cairns was a bumpy one. Smiling to ourselves, we jumped on the shuttle bus straight from the airport, full of positive energy for our weekend ahead. We weren’t going to let wet, cloudy skies ruin our morning. After all, we’d already made a pact with the universe for perfect conditions for the next day when we were due to head out to Moore Reef. Now, all we had to do was keep channelling our energy and everything would be alright. When we woke the following morning, we were excited to see just a thin layer of cloud, with the hot, tropical sun beginning to burn its way through. After a quick breakfast at a nearby café, we wandered excitedly to the Reef Fleet Terminal, ready to check in and begin our journey to the Moore Reef pontoon – our home for the next two days. Once on board, we were introduced to the crew, and to the two lovely ladies from Minnesota who’d be sharing the unique experience of spending a night on the Great Barrier Reef with us. We were briefed on what to expect, and then Jake, the dreadlocked Starlight host and pontoon lifeguard, told us exactly what we didn’t want to hear – “There’s probably around a 90% chance that it’ll rain tonight, so we will have to make a decision whether to stay on the pontoon before the boat leaves this afternoon”. I refused to let myself get disheartened and continued to channel my positive energy into the universe. Rain? I don’t think so. Nothing was going to ruin our third attempt at Sunlover by Starlight. After the boat had left the harbour and we were finally on our way to the reef, we ran into our old friend Pablo – one of Sunlover’s resident marine biologists. He took us on a snorkel safari on our first visit to the pontoon last year, and he was very excited to take us out again this time around. As soon as the boat docked, we were straight onto the pontoon and into the water with Pablo by our side. Snorkelling is always fun, but it’s even more so when you have a passionate marine biologist teaching you about the reef at the same time. It was like being in a real-life documentary; Pablo would dive down or point out a section of the reef, or creature swimming by, and then he’d come to the surface and tell us all about it. I’d put my head under the water just enough to see but kept my ears above, so I could hear Pablo. It was incredible! It wasn’t long before we saw our first turtle for the weekend. It was literal minutes after we’d jumped off the pontoon, and I was beyond excited to be the first one to see it. I spluttered “TURTLE!” through my snorkel and gestured wildly in the direction of the graceful animal, who was gliding through the water looking for something to eat. 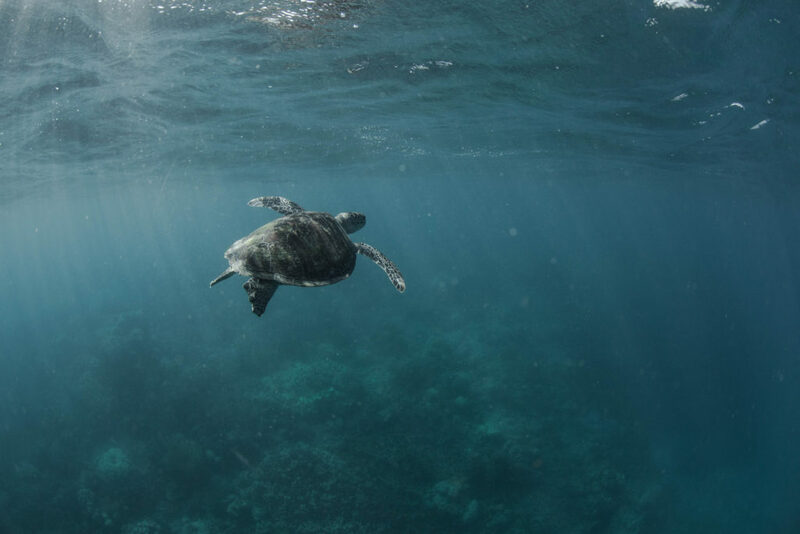 We swam up to her (we knew she was female, as Pablo had already informed us that all resident turtles of Moore Reef are ladies) and floated above her as she dug her head between rocks and coral in search for algae. Over the next two days, I’d spend the large majority of my time doing just this. Our live-action documentary continued, and we swam around in awe as Pablo described different types of corals and their function on the reef. The staghorn coral for example, a very common sight on Moore Reef, grows about 15cm per year, meaning it can regenerate fairly quickly. Pablo dove down a few times and showed us exactly where new corals were growing, which was so cool to see. I turned around in time to see a very large fish swim casually into view from the depths and realised immediately that this wasn’t a regular, or dangerous, occurrence. It was a Humphead Parrotfish, and it was enormous. It had a large bulge on the top of its head, which it used with great force to bump into the coral beds before opening its mouth and devouring the coral with its large beak. The crunching sound you hear under the water while these guys are feeding is unbelievable! Think of the loudest eater you know and times it by a hundred – that’s the Humphead Parrotfish. Can you spot Pablo and I in this shot? These HumpHead Parrotfish were massive! We finished our snorkel tour and I headed back to the pontoon for a rest. Scott decided to stay in the water, and Pablo took another group on safari. I was standing at the edge of the pontoon when I saw Pablo gesturing towards Scott, who quickly swam over. Pablo then spotted me on the pontoon, “Courtney! Quick!” he cried. Without hesitation, I grabbed my snorkel and fins and jumped back into the ocean and swam as fast as I could to the spot where Pablo and Scott had gathered. Our new Humphead Parrotfish friend from earlier? 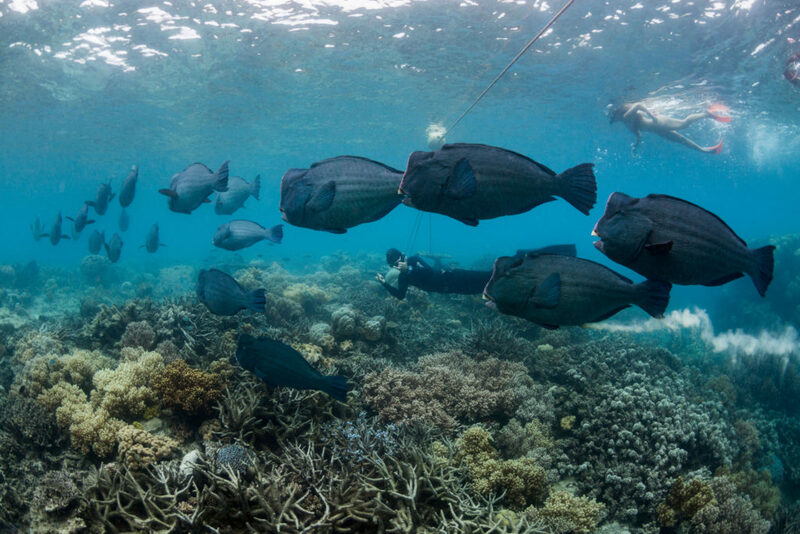 He’d returned to the reef, this time with an entire school of his mates swimming alongside. There were up to twenty of them, maybe even more, and I watched in awe as they banged their bulging heads against the reef, absolutely decimating it as they all went in to feed, crunching and munching loudly on the coral. It was an incredible sight – and a rare one at that. It wouldn’t be our only unique moment that weekend. After an entire morning spent swimming on Moore Reef, we finally had to return to the pontoon and say goodbye to all the day-trippers who were leaving on the boat, headed back to the mainland. For us, our adventure was only just beginning. By now, the sun had well and truly burned off the clouds, and we were left with a bright, sparkling and completely still afternoon. Scott and I couldn’t believe our eyes – after so long, we finally had what we’d wished for. Perfect conditions. It was so still, you can barely see where the ocean meets the horizon! Even the crew were gobsmacked. “We have maybe twelve days like this per year!” exclaimed Jake as he admired the stunning conditions on the reef. We couldn’t believe it either. All our positive energy and manifestations had actually paid off, and we were left with a still, quiet and absolutely beautiful afternoon. For the ten or so minutes before Andy fired up the pontoon’s generator, it was absolutely silent. There wasn’t a breath of wind causing the sound of tiny waves lapping against the pontoon, and no people yabbering away. It was fully, completely and utterly quiet. It was very peaceful. We even saw a small black tip reef shark swimming slowly around the pontoon once the sound of the boat was nothing but a distant memory; he obviously only felt comfortable to emerge from the depths after all the humans had left for the day. Well, almost all the humans. Needless to say, it wasn’t long before we all jumped back into the water again. With the sun now shining bright, the clarity under the water was unbelievable. We spent some time snorkelling around the reef near the pontoon, chasing fish and searching for our turtle friends while Jake and Andy set up our swags on the pontoon. When they were done, Jake called us all in. “Do you guys want to go exploring behind the pontoon?” he asked. We all nodded in unison. Of course, we did! Along with Jake, and our new friends from Minnesota, Scott and I jumped back in the water for the millionth time that day, and as a group we ventured off into the still ocean. We followed the edge of the reef right around to the section of reef behind the pontoon, only accessible after the boat had returned to Cairns for the day. The sun shone straight down into the water. It wasn’t long before we encountered another turtle. Despite losing count of how many times I’d swum with a turtle that day, it still felt like the first time. We watched her glide up from the depths of the ocean, the sun reflecting off the back of her shell. I always admire the grace of a turtle in the water; they move with such elegance and ease, and this one seemed so comfortable with us. We emerged from our sunset swim completely drained of energy, but full to the brim of happiness and contentment. We were greeted back at the pontoon by Andy and an afternoon tea spread of fruit, cheese, crackers and nuts. We replenished our dwindling energy stores, and then headed off to one of the changerooms, which had been converted into a shower. A hot shower, I might add! Our awesome accommodation for the evening. After rinsing the salt from my skin with warm water, I changed into fresh clothes and joined the others back on the deck for dinner. With Andy and Jake in charge of cooking the BBQ, Scott and I enjoyed a nice, cold beer while we waited for our dinner. Finally, our feast was ready, and it was one of the best spreads I have ever seen! I’d informed the Sunlover crew beforehand of my dietary requirements, and I was blown away by the amount of incredible vegan food they’d prepared for me. I’m not sure if they thought there were ten other vegans on board that night, but they provided so much food just for me it was insane! All of it was delicious, too. After dinner, we were all well and truly exhausted. We sat on the top deck of the pontoon on the large beanbags and watched the giant trevally and other large fish dart around and chase fish in the water right next to the pontoon, which was lit up by lights. Eventually, our eyes just couldn’t stay open any longer and we all retreated to our individual swags for the night. As I lay in my swag, I stared up at the bright night sky, illuminated by the enormous full moon rising over the ocean. It was hard to see all the stars with such bright light from the full moon, but I thought it was an even more beautiful sight with the moon anyway. Finally, I zipped up my swag and closed my eyes, dreaming of the adventures still to come the following day. I was woken a few hours later by something wet on my face. I could hear something too, loud splashing noises right above me in my swag. I soon realised that the rain had arrived. Grabbing the top layer of my swag, which had been left open in the hot night, I quickly zipped it up over my head, protecting myself from the light, early morning shower. By the time I dozed off again a few minutes later, the rain had already completely stopped. Around 6am, Scott whispered to me from his swag, “Court, wake up!” Groggily and blind without my contact lenses, I opened my eyes and unzipped my swag. Despite not seeing clearly, there was no mistaking that the sky was completely pink. I ran down to the changeroom and quickly got dressed, popped in my contacts and washed my face. Then, I joined Scott back on the top deck of the pontoon to admire the beautiful sunrise. There was a low bank of clouds just above the horizon, which reached into the sky like giant, fluffy mountains. Oh, and the colour. So many different shades of pink and purple. Pure magic. A sleepy, but very happy face. After admiring the view from the top of the pontoon, we decided to head down to the water. Standing on the stairs, we let the small waves lap against our legs, smiling into the cool breeze. Suddenly, I saw a familiar face – a little, turtle face. She floated to the top of the ocean, and we could see her back, where she’d lost part of her shell. Linda swam casually around the side of the pontoon, lazily chomping on a jellyfish buffet breakfast. She hung around for a while, eating and swimming and floating around. It was a beautiful way to start our second day at Moore Reef. It wasn’t long before Jake and Andy had prepared our next feast on the pontoon – breakfast. Again, they’d severely over catered for the single vegan on board, but hey, I wasn’t complaining one little bit. There was muesli, coconut yoghurt, an entire container of mango chia pudding, two whole litres of orange juice just for me, hash browns, toast, and fruit – it was hard not to overindulge and eat every last bite! Once we’d eaten enough to fill our hungry tummies, it was time to get back into the water. By now, the sun was high in the sky and there was a light breeze, making the reef even more inviting. We grabbed our gear and jumped off the pontoon, ready to enjoy the last few hours of paradise without another soul in sight. I’ll always remember this particular morning. By now, my turtle radar was pretty bang on. 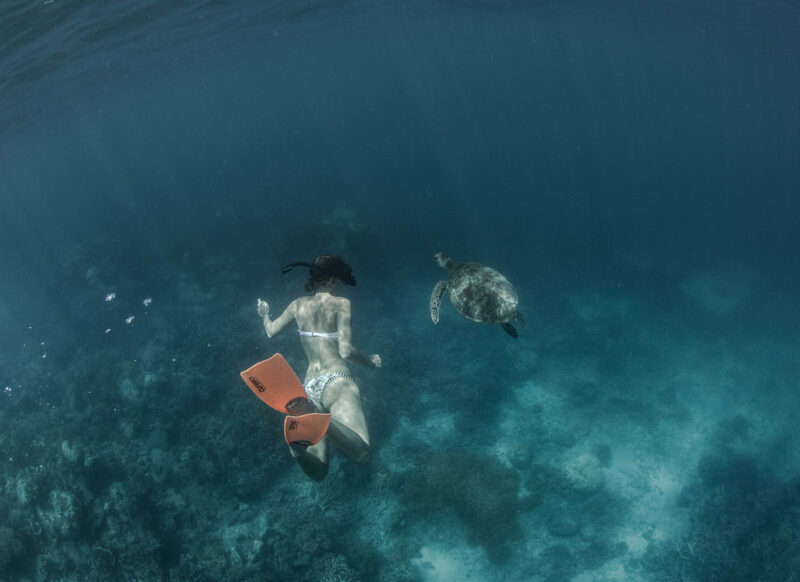 I knew most of the spots on Moore Reef where the turtles seemed to prefer to look for food, so naturally this was the first place we went after we jumped into the water. It wasn’t long before we found Linda, yet again. 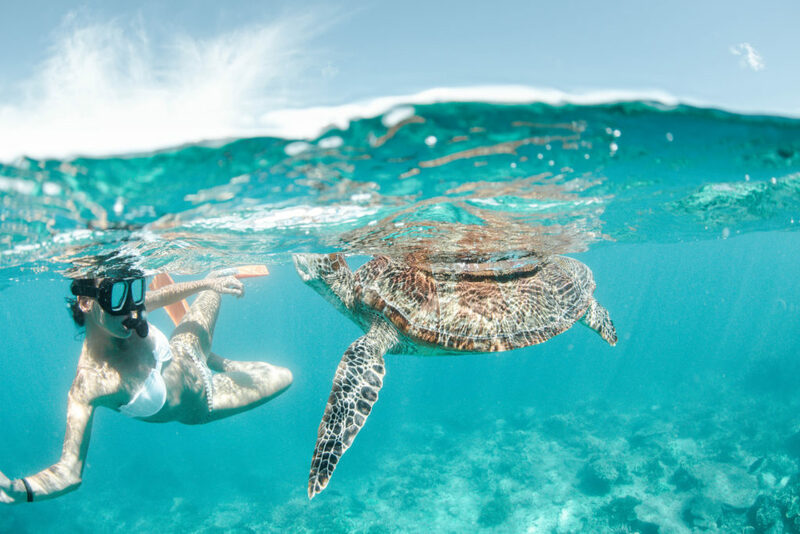 She was exactly where we thought she’d be, and over the next hour we found ourselves in a little routine with our green turtle friend. She’d spend around five to ten minutes munching on the algae on the reef, while we patiently floated above her. Then, as she began to swim to the surface, we’d follow at a comfortable distance, snapping photos and enjoying such a peaceful interaction with her. She almost always swam right up to us, almost to the point of touching, and as she’d take a breath she’d frolic on the surface for a bit, letting us take photos and swim around her. It was almost as if she was posing for us! Then, she’d swim back to the bottom of the reef and continue her search for food. Another five or ten minutes later, she’d swim back to the surface and we’d repeat our routine. At one point, the two ladies from Minnesota who were sharing our Sunlover by Starlight experience with us swam over to us, and we excitedly showed them that we’d found another turtle. They enjoyed swimming with and observing Linda, but after about five minutes they swam off to continue exploring the reef. It was the moment that I realised I had a real passion for the reef, and in particular, the sea turtles that called it home. I couldn’t bear to leave Linda. Yes, there was plenty of reef to explore, yet I just couldn’t and didn’t want to leave her side. 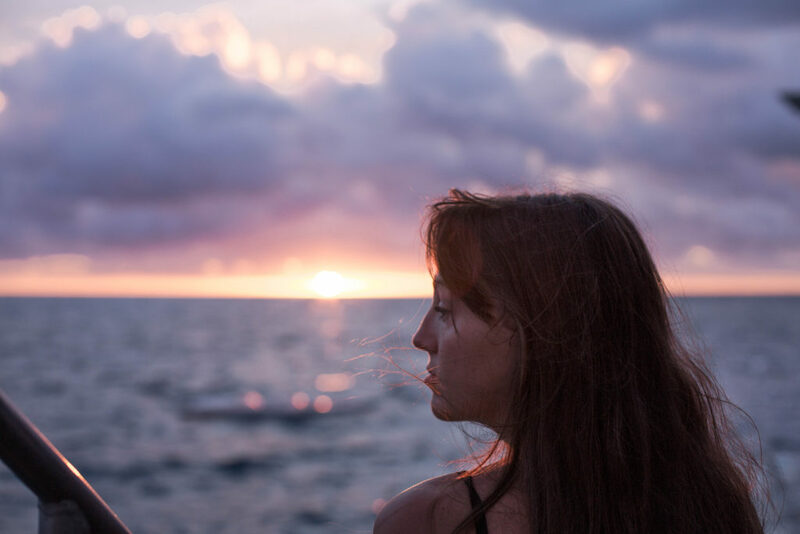 I was absolutely entranced by her, and I knew I had to take advantage of our time together before the boat from the mainland arrived again, with hundreds of passengers in tow. So, there I stayed, on the stretch of reef where Linda was hanging out, for almost an hour. We repeated our above routine many times, until I heard the voice of Jake calling us back to the pontoon. The boat was almost there. Reluctantly, Scott and I said goodbye to Linda, with hope that we’d see her again that day. We swam over to the pontoon and stood upon the upper deck watching the boat arrive. It was a strange feeling to see the boat return, full of people. Instantly, our serene, quiet pontoon was a hive of noisy activity, and we felt like our private space was being invaded. Unfortunately, though, we had to share. Over the next few hours, a heavy cloud cover came through, and we said goodbye to the sun for good. I was very thankful for our beautiful, sunny morning! Looking like prunes and feeling like salt shakers, Scott and I had a break from the water and headed straight for the yummy buffet lunch while the others were all occupied with getting in the water. We were exhausted, but after a quick feed and rest, we headed straight back for the reef. There were only a few hours left, and we wanted to see Linda once again. It didn’t take long to find her, and as expected, she was going between casually searching the reef for food and swimming to the surface to breathe. This time, however, she was wandering all around the reef rather than hanging in one spot, so it was fun to follow her around and see where she went, all while exploring the reef ourselves. In the distance, we saw a massive storm starting to roll in. We decided to head back to the pontoon, dry off and get ready to head back to the mainland before it hit. Well, we had to have a few runs down the waterslide first! Finally, it was time to leave. By now, it had started to rain as we sat on the top level of the boat, drying off while we sipped hot tea. I was sad to say goodbye to Moore Reef, but also excited to get back to the mainland for a shower and a nap. I just wanted to say a massive thank you to Rachel, Jake, Andy, and the rest of the team at Sunlover Reef Cruises for what was truly one of the best weekends of my life. Another special thanks goes out to our mate Pablo, whose experience, passion and knowledge of the Great Barrier Reef is unrivalled. I cannot recommend a visit to the beautiful Moore Reef with Sunlover Reef Cruises enough, and again I thank you all for a great experience! I spent two whole days playing in the beautiful waters of the Great Barrier Reef, with so much marine life at my fingertips. I swam with turtles for hours, I saw creatures only spotted on rare occasions, and I felt like I really, really lived. It wasn’t just about swimming and playing and having fun. It was about learning more about the fragile state that the world’s oceans are currently in. When we got home, Scott and I watched the third episode of Blue Planet 2 – Coral Reefs. I strongly urge you, if you haven’t already, to watch this episode. The future of our entire planet and all the creatures on it (including us humans) is at risk. We are the only species who are contributing to this, and the only species that can stop it. Linda is such a cutie and its awesome that you got to spend so much time with her 🙂 And she really is the most photogenic sea creature out there! Hello gorgeous! LOVE your post…those turtles are amazing aren’t they? !